You might imagine that a report by a multinational observer force documenting a 20-year reign of terror by Israeli soldiers and Jewish settlers against Palestinians, in a city under occupation, would provoke condemnation from European and US politicians. But you would be wrong. The leaking in December of the report on conditions in the city of Hebron, home to 200,000 Palestinians, barely caused a ripple. About 40,000 separate cases of abuse had been quietly recorded since 1997 by dozens of monitors from Sweden, Norway, Switzerland, Italy and Turkey. Some incidents constituted war crimes. Exposure of the confidential report has now provided the pretext for Israeli prime minister Benjamin Netanyahu to expel the international observers. He shuttered their mission in Hebron this month, in apparent violation of Israel’s obligations under the 25-year-old Oslo peace accords. Israel hopes once again to draw a veil over its violent colonisation of the heart of the West Bank’s largest Palestinian city. The process of clearing tens of thousands of inhabitants from central Hebron is already well advanced. Any chance of rousing the international community into even minimal protest was stamped out by the US last week. It blocked a draft resolution at the United Nations Security Council expressing “regret” at Israel’s decision, and on Friday added that ending the mandate of the Temporary International Presence in Hebron (TIPH) was an “internal matter” for Israel. The TIPH was established in 1997 after a diplomatic protocol split the city into two zones, controlled separately by Israel and a Palestinian Authority created by the Oslo accords. The “temporary” in its name was a reference to the expected five-year duration of the Oslo process. The need for TIPH, most assumed, would vanish when Israel ended the occupation and a Palestinian state was built in its place. While Oslo put the PA formally in charge of densely populated regions of the occupied territories, Israel was effectively given a free hand in Hebron to entrench its belligerent hold on Palestinian life. Several hundred extremist Jewish settlers have gradually expanded their illegal enclave in the city centre, backed by more than 1,000 Israeli soldiers. Many Palestinian residents have been forced out while the rest are all but imprisoned in their homes. TIPH faced an impossible task from the outset: to “maintain normal life” for Hebron’s Palestinians in the face of Israel’s structural violence. Until the report was leaked, its documentation of Israel’s takeover of Hebron and the settlers’ violent attacks had remained private, shared only among the states participating in the task force. However, the presence of observers did curb the settlers’ worst excesses, helping Palestinian children get to school unharmed and allowing their parents to venture out to work and shop. That assistance is now at an end. 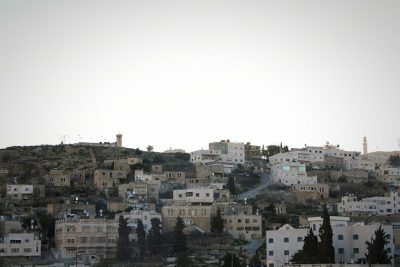 Hebron has been a magnet for extremist settlers because it includes a site revered in Judaism: the reputed burial plot of Abraham, father to the three main monotheistic religions. But to the settlers’ disgruntlement, Hebron became central to Muslim worship centuries ago, with the Ibrahimi mosque established at the site. Israel’s policy has been gradually to prise away the Palestinians’ hold on the mosque, as well the urban space around it. Half of the building has been restricted to Jewish prayer, but in practice the entire site is under Israeli military control. As the TIPH report notes, Palestinian Muslims must now pass through several checkpoints to reach the mosque and are subjected to invasive body searches. The muezzin’s call to prayer is regularly silenced to avoid disturbing Jews. Faced with these pressures, according to TIPH, the number of Palestinians praying there has dropped by half over the past 15 years. In Hebron, as at Al Aqsa mosque in Jerusalem, a Muslim holy site is treated solely as an obstacle – one that must be removed so that Israel can assert exclusive sovereignty over all of the Palestinians’ former homeland. A forerunner of TIPH was set up in 1994, shortly after Baruch Goldstein, an Israeli army doctor, entered the Ibrahimi mosque and shot more than 150 Muslims at prayer, killing 29. Israeli soldiers aided Goldstein, inadvertently or otherwise, by barring the worshippers’ escape while they were being sprayed with bullets. The massacre should have provided the opportunity for Yitzhak Rabin, Israel’s prime minister of the time, to banish Hebron’s settlers and ensure the Oslo process remained on track. Instead he put the Palestinian population under prolonged curfew. That curfew never really ended. It became the basis of an apartheid policy that has endlessly indulged Jewish settlers as they harass and abuse their Palestinian neighbours. Israel’s hope is that most will get the message and leave. With Israeli Prime Minister Benjamin Netanyahu in power for a decade, more settlers are moving in, driving out Palestinians. Today Hebron’s old market, once the commercial hub of the southern West Bank, is a ghost town, and Palestinians are too terrified to enter large sections of their own city. TIPH’s report concluded that, far from guaranteeing “normal life”, Israel had made Hebron more divided and dangerous for Palestinians than ever before. In 2016 another army medic, Elor Azaria, used his rifle to shoot in the head a prone and badly wounded Palestinian youth. Unlike Goldstein’s massacre, the incident was caught on video. Israelis barely cared until Azaria was arrested. Then large sections of the public, joined by politicians, rallied to his cause, hailing him a hero. Despite doing very little publicly, TIPH’s presence in Hebron had served as some kind of restraint on the settlers and soldiers. Now the fear is that there will be more Azarias. Palestinians rightly suspect that the expulsion of the observer force is the latest move in efforts by Israel and the US to weaken mechanisms for protecting Palestinian human rights. Mr Netanyahu has incited against local and international human rights organisations constantly, accusing them of being foreign agents and making it ever harder for them to operate effectively. And last year US President Donald Trump cut all aid to UNRWA, the United Nations’ refugee agency, which plays a vital role in caring for Palestinians and upholding their right to return to their former lands. Not only are the institutions Palestinians rely on for support being dismembered but so now are the organisations that record the crimes Israel has been committing. That, Israel hopes, will ensure that an international observer post which has long had no teeth will soon will soon lose its sight too as Israel begins a process of annexing the most prized areas of the West Bank – with Hebron top of the list.